- Stamp to the MAX! Preserving memories is one of my favorite hobbies! I am sure you will love this article as much as I do. Don’t hesitate, start today keeping those wonderful memories alive that can be shared for years to come. Many of the most meaningful and important moments in our lives can be recognized only in hindsight, like that chance meeting that eventually led to an engagement ring, that one classroom lesson that started you on a lifelong career path, or the random recipe you tried one night that turned into a long-standing family tradition. There are other moments that you know from the beginning are going to be important and transformative. Some you anticipate for years, like a wedding, the birth of a child, an anniversary, or a milestone birthday. Others, such as a funeral, may be less welcome and anticipated, but no less life-changing. All these events will be recorded in your memory and reminisced about for years to come. They are the threads from which family history tapestries are woven. If we approach them mindfully, these major life events can provide wonderful opportunities to make larger connections to family heritage and ancestry. Here are three ideas for doing just that. Marriage is about more than the joining of two people; it also links entire families together, reaching back generations. Thus, a wedding celebration is the perfect time to acknowledge and celebrate this joyous multigenerational union that surely sparks rejoicing in heaven as well as on earth. When my husband and I married in 2004, we kept the decorations at our reception fairly simple. But there was one display that meant more to me than almost anything else in the room. On a table near the entrance, I arranged a series of matching frames that contained three generations of wedding photos. In the center was our engagement photo, flanked by our parents’ wedding photos: Donald and Beverly Lucas, married in 1959, and Janet and Jeff Hill, married in 1973. On either side of those photos stood the wedding pictures of Donald’s parents (1922), Beverly’s parents (1932), Jeff’s parents (1941), and Janet’s parents (1947). Many of our guests were drawn to this simple display, which illustrated how the joining of six young couples over the course of 51 years eventually led to this particular moment. Without each of them, there would have been no celebration that day. After displaying these heritage wedding photos in our bedroom for years, I eventually preserved them in a keepsake album that includes names, dates, and places for each marriage. The next time there’s a wedding in the family, hunt down ancestral wedding photos from both the bride’s and the groom’s families and present them as a gift—either framed or inside a simple album, with room for the bride and groom to add their own wedding photo at the end. You might find some of the wedding photos you need by searching your family tree on FamilySearch.org. To access photos from the other half of the wedding party, however, you’ll have to recruit a member of that family to search their online family tree. When my in-laws celebrated their 50th wedding anniversary in 2009, they opted for a low-key backyard barbecue, with just their children and grandchildren in attendance. To make the day extra special for them, we created a memory book at the event and sent it home with them. My husband took a picture of each attendee, and we printed the photos on the spot using a personal photo printer. We handed each person a 5×7-inch card, and asked them to share a treasured memory of Don and Bev or a note of love and thanks. Their kids, grandkids, and in-laws wrote about family trips, harrowing bike rides down steep Carnation Drive, memorable injuries, visiting Bev when she worked in the gift wrap department of the old ZCMI, countless hours spent eating and chatting on the patio, and the thoughtful gifts Don and Bev would drop off, just because. We paired each person’s photo with their handwritten card and slipped the photos and cards inside a photo album to present to the honored couple. On the first page of the book, we placed their original wedding photo next to a photo of just the two of them taken at the party, 50 years to the day later. This idea works equally well for a milestone birthday party. We created similar albums (on a much larger scale) for my grandma and grandpa on their 80th birthdays. Put one person (probably you) in charge of collecting the photos and memories during the event. If you ask people to bring something in advance or expect them to follow up after the fact, you’ll find that they don’t all do their part. Instead of individual portraits, make sure each person takes a photo with the guest of honor, so everyone has a recent picture of themselves with their parent or grandparent. Try this idea using a Polaroid camera (yes, they still exist) or a Fujifilm Instax, which take and print photos instantly. 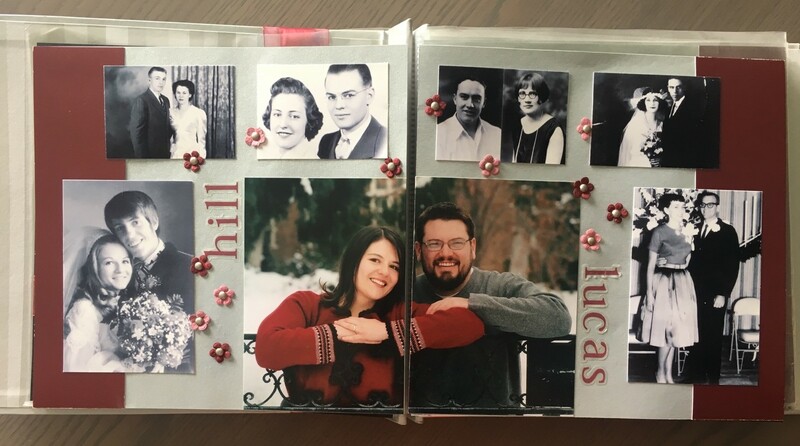 Have each person tape or glue their picture inside a spiral-bound journal or art journal with heavier-weight pages (can be found at big box stores), and write a memory next to the picture. Use your smartphone to take the pictures, and print them on the spot using a mini wireless photo printer designed for that purpose. Have everyone upload their photos and memories to Instagram or another social-media app using the same hashtag (such as #donbevlucas50th). Capture audio recordings of each person’s memories using the FamilySearch Memories app. If you create a physical keepsake, scan or photograph each page to upload to the guest of honor’s profile on FamilySearch’s Memories. As a child, Grandma used to dress the barn cats in doll clothes and try to sneak them into the house, despite the fact that they would be flung by their tails out the back door and over the lilac bush if her mom ever spotted them in the house. At age 12, she had to take over all the ironing (using a heavy old flat iron heated on the stove), housework, and cooking (including feeding large hay crews on the farm) for two months after her mom broke her shoulder in a car accident. She attended her first high school dance with my grandpa on September 17, 1943—and they got married four years to the day later. She served as the LDS seminary president during her senior year of high school, on top of being on the drill team and student council. Not wanting these and other details to get lost to history, I asked my aunt to send me a copy of her remarks so I could post them on my grandma’s profile on Family Tree. I posted several of these pictures on my Facebook page for our fellow family members to enjoy, and I also uploaded them to Family Tree, where they’ll be accessible to all of Grandma’s posterity. Depending on your emotional state at the time of the funeral, see if you can listen for tidbits and details that are new to you about your loved one, so you can make sure these stories are preserved for future generations. Maybe even ask for a copy of the life sketch after the funeral, so you can keep it for your own records or post it to Family Tree. Take a moment to photograph the photo displays for the same purpose. 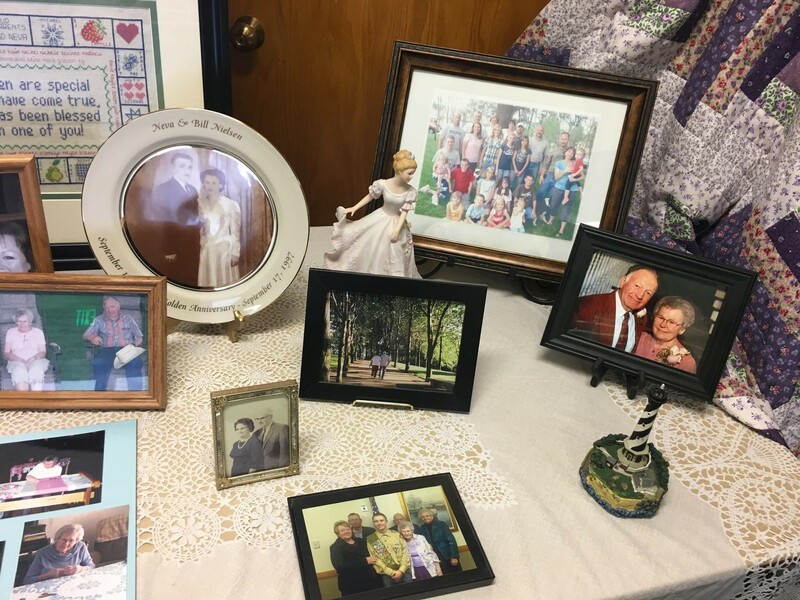 Bonus idea: After attending the funeral of a family friend, Wendy Smedley of Centerville, Utah, offered to collect all of the tributes posted to the woman’s Facebook page and upload them to Family Tree—with permission and access granted by the family, of course. Sometimes being just outside the inner circle will make you the perfect person to perform this kind of service. Immediate family members will often be too overwhelmed and grief-stricken, and they’ll appreciate this small but simple act that can impact generations to come. Click here to shop online to purchase the necessary products and start preserving those memories today!